Do You Hear Somebody Singing Alleluia, Or Is It Just Me?? One of my favorite year-end assignments is for the Inland Register, the monthly news publication for the Roman Catholic Diocese of Spokane in Washington State. Editor Eric Meisfjord always asks me to do a Christmas cover. 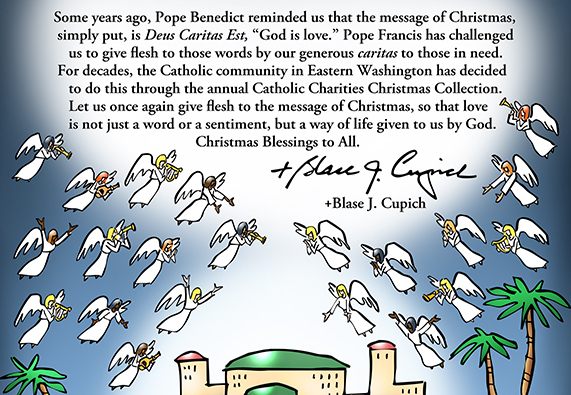 The bishop’s Christmas message is at the top. Here’s a close-up which makes it easier to read. I roughed out several ideas for the cover. Eric made his selection based on this sketch. I was curious to see what the illustration would look like with a full night sky, so I did this variation, deleting the bishop’s message, and expanding the heavenly host (Lk 2:13). If you look closely, you’ll see that some of the angels are duplicates, with different skin and hair color. There’s a little sleight of hand in the musical notation. Anybody spot it? Any music majors out there? The question mark is actually a reconfigured bass clef. I created the clef with Photoshop’s Shape tool. I narrowed it, moved the dots aside, and reshaped it slightly using the Warp tool. I deleted one of the dots, enlarged the other one and repositioned it. Voilà!– a musical question mark. The musical notes are also Photoshop shapes. The original stems were thin, and I worried about their visibility. 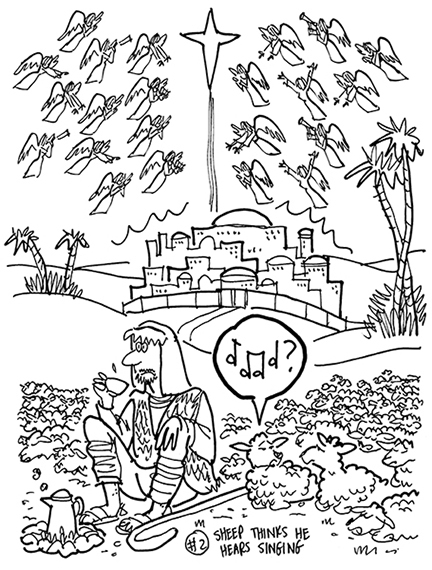 Have you ever tried to imagine the night sky filled with the heavenly host singing praise? 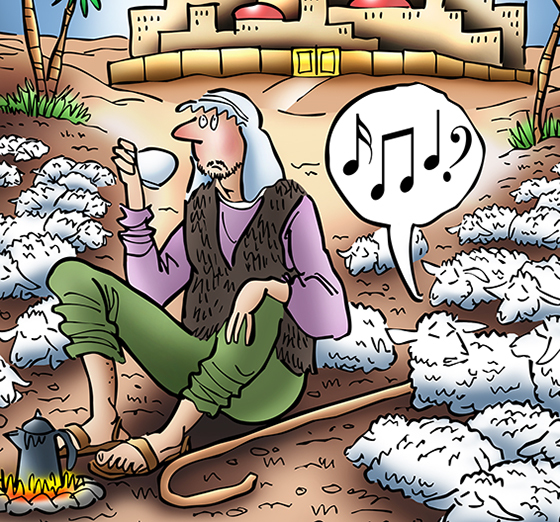 Did you know shepherds took coffee breaks, and that sheep can speak musical notation? Merry Christmas From Downtown Spokane! All is well thanks and the course is going strong! Many happy returns to you and yours! 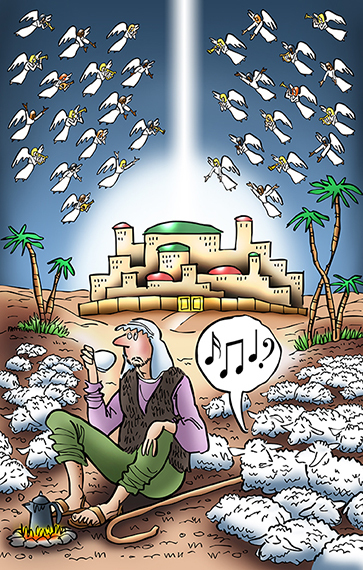 ♪ ♫ ♩ ♬ Happy Christmas to you Mark ♪ ♫ ♩ ♬ You can be so glad that you don’t need to hear me singing! Do you play the song? Applause!!!! No, that’s not me playing the music on this blog post, but I shall accept your kind applause anyway– thank you, dear Tutti!! Oh, the brain is obviously not functioning properly as I was hearing notes form Handel’s “Messiah” and Beethoven’s Pastoral!!! None of them seemed right though! Duh, so much for my musical perception! 😦 BUT I can happily say that I can hear “Alleluia”!!!! The new pope and the retired pope both raised their glasses to me?? I wonder what they’re drinking?? If they’re sitting around a wassail bowl, I wish they’d invite me over!! Καλά Χριστούγεννα, my dear Marina, and I wish you much happiness and success in 2014!! 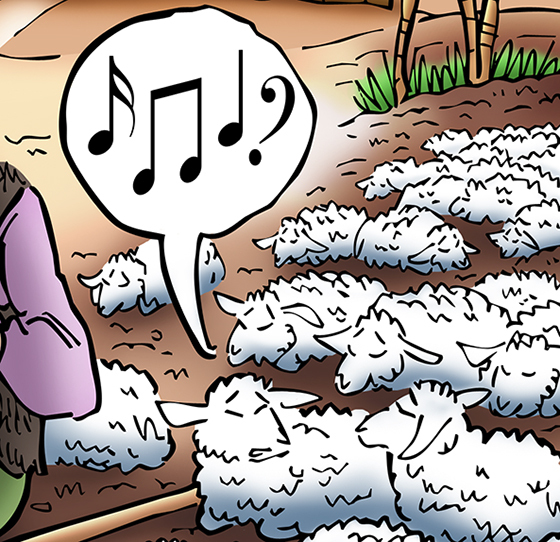 What a sweet, sweet lamb!! and here comes the funnest part: just after reading your little song I went on singing: “One ha’ penny, two ha’ penny, Hot cross buns! If you have no daughters, Give them to your sons…” Ah, don’t ask!!!! Once again, Mark, I smile at the mention of Spokane. I’ve also received help and support through Catholic hospital networks, services, and charities, so I greatly appreciate Cupich’s message. I have personally seen how Eastern Washington has been helped by good Catholic people. I’d forgotten about your Spokane connection, Jak. It was very gratifying to hear your testimonial. “Love one another as I have loved you.” (Jn 13:34) Yes, indeed– imagine the kind of world we’d have if we could all put that into practice. I appreciate the wishes of health very much, Mark, as I am undergoing a “trial period” spinal cord stim surgical procedure on the 30th. That’ll be an interesting way to go into 2014 for sure… I hope your holidays go well too, Mark, but hopefully with a little less spine-tingling adventure (yes, full pun intended)! Ha!! My kinda pun, Jak– excellent! And you shall be at the top of my prayer list on the 30th. Hang tough, amigo! Love the message, the music and your excellent illustration. 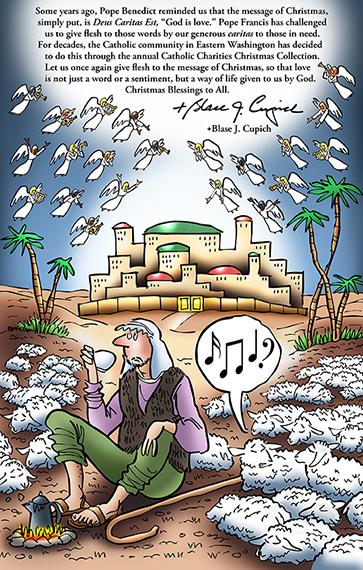 If I were a shepherd, I couldn’t think of a better place to take a coffee break than under a star-filled night sky while listening to the angels’ heavenly music. Merry Christmas and Happy New Year to you and yours, Mark. Thank you, dear Judy! One of these starry, starry nights, you and I shall have to pull up a sheep, sit around the fire, have a cup of Starbucks of Bethlehem coffee, and reminisce about dear old Upstate New York!! Wishing you and Dave and all your family the merriest of Christmases, and much happiness in 2014!! Thanks, Mark. That sounds like a wonderful way to pass a cold Central New York evening. A toast to you and yours. I posted a message from Facebook on your blog. Hope it makes it thru. Merry Christmas and Happy New Year to you and your lovely wife. Thanks, Judy! Got your wonderful FB message, and it warmed my heart faster’n hot mulled cider and a blazing Yule Log combined! Thanks for digging the coffeepot! !– one of my own favorite bits. Your kindness, comments, and wonderful self are all enormously appreciated– Maddie Christmas!!! Ah ha! I have finally found the source of the music playing on my reader! Wonderful post Mark, I hope you and yours have a very Merry and safe Christmas! Thank you also for all your supportive comments about my art over the year, I have really valued them…. Thank you, Jen, for all your cheer and support. It means a lot, I’m glad I know you. Your talents are wonderful, and wonderfully diverse. I shall look forward to your posts in 2014. A very Merry Christmas to you and yours! !